In large skillet, add oil over medium heat until light wisps of smoke appear (about 60 seconds). Add onions and cook, stirring, until softened but not browned (about 8 minutes). Add garlic, ginger, cumin, salt, pepper, nutmeg and cloves. Cook for and additional minute, stirring to combine. Add tomatoes with juice and vegetable broth, stirring to combine. Increase heat and bring to a boil. Add potatoes and stir to combine. 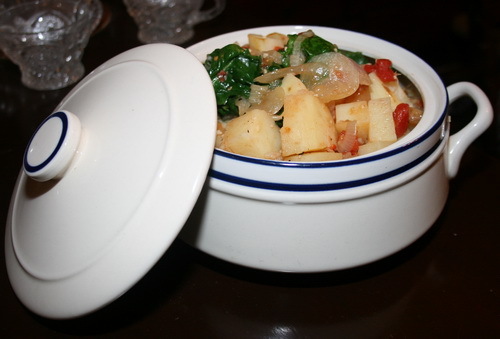 Place in a baking dish and bake in at 350 for 45-60 minutes or until potatoes are fork tender. At this point, turn oven off. The residual heat will complete the cooking process. In 1/4 lb batches, add spinach, stirring well after each addition, until spinach submerged in the liquid. In small bowl, dissolve cayenne in lime juice. Add to baking dish and stir well. Return to oven for another 10 minutes, or until spinach is wilted. Serves 8 as a side dish, 4 as a main course.